With a colourful past that pre-dates the Domesday Book, Addington Palace is set in 163-acres of landscaped grounds in Surrey. King Henry VIII courted Anne Boleyn and had a hunting lodge here before the Palace became the country retreat for six Archbishops of Canterbury. The Palace then saw generations of musicians trained here when the building housed the Royal School of Church Music. With the added bonus of two venues onsite we are able to cater for a variety of events including Christmas Parties, Exhibitions, Gala Balls, Conferences and Weddings. As well as being ideal for Conferences, Exhibitions, Banquets and Team Building Activities, the venue is also licensed for Civil Ceremonies with excellent facilities for Wedding Receptions catering from 80 up to 750 guests. Without doubt the best venue in Surrey. Our highly skilled team of chefs specialise in European and Caribbean Cuisine. They are therefore able to compliment events with your choice of catering or create a fusion combining various tastes. 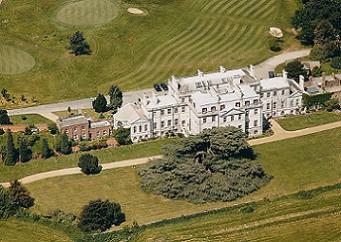 The lower ground floor of Addington Palace boasts a luxurious Health Spa and Country Club. The Club specialises in offering exclusive membership and a range of Pamper Days and spa treatments. We are located near to Croydon’s town centre and only 12 miles from the centre of London. Addington Palace enjoys easy access to both Heathrow and Gatwick airports and has adequate, free onsite parking. There are frequent train services to East Croydon BR Station which links to the New Addington tram line. Gravel Hill tram stop is located at the bottom of our drive. Its location, set in beautiful grounds with splendid views on all sides, belies the fact that you are so close to the hustle and bustle. To hold an event here and experience our expert hospitality is to enjoy a stress–free day in stunning surroundings. We look forward to welcoming you soon.